"No one thought she had the courage, the nerve, or the lingerie." Shirley Valentine is a middle-aged housewife from Liverpool. Shirley is bored with her life. Her marriage used to be exciting, but lately she and her husband have fallen into a relationship rut. Shirley even finds herself talking to the wall even while she prepares her husband's chip'n'egg, and she wonders what happened to her life. She is constantly comparing her current life with what she used to be like and feels she's stagnated and in a unsatisfied. However, all that changes when her best friend wins an all-expenses-paid vacation to Greece for two. Shirley goes on the trip and begins to see the world, and herself, in a different light. In Greece she learns that life is worth living. Her husband, Joe, is upset that she just left. He doesn't know what to do to get her to come back. Eventually their son convinces Joe to just go join her in Greece. They reunite and hopefully learn that life just needs to be enjoyed. 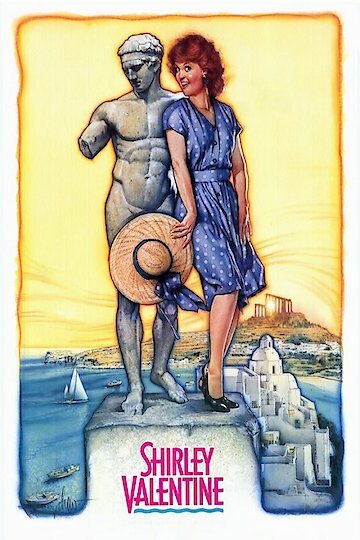 Shirley Valentine is currently available to watch and stream, download, buy on demand at Amazon Prime, Hulu, Amazon, iTunes online.